Taco Bell Testing $1 Folded Quesadilla "Stackers"
Carvel partners with Lotus Biscoff brand cookies to release a number of new desserts featuring cookie butter ice cream. - Cookie Butter Soft Ice Cream - Soft ice cream blended with Lotus Biscoff Cookie Butter. - Cookie Butter Scooped Ice Cream - Hand-scooped Cookie Butter ice cream mixed with caramel and Lotus Biscoff cookie crumbles. - Cookie Butter Sundae Dasher - Layers of Cookie Butter soft ice cream, caramel, and Lotus Biscoff cookie crumbles, topped with whipped cream, drizzled with caramel, and dusted with more cookie crumbles. - Cookie Butter Shake - Cookie Butter soft ice cream blended with Lotus Biscoff cookie crumbles. - Cookie Butter Flying Saucer - Cookie Butter soft ice cream sandwiched between two chocolate crackers. Carvel's Cookie Butter ice cream desserts are available for a limited time through May 28, 2017. 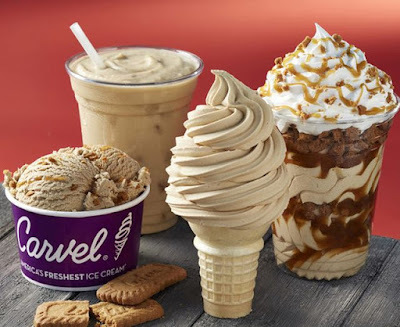 If you're looking to try the new flavor for free, Carvel will be celebrating their annual Free Cone Day on Thursday, April 27, from 3 to 8 PM at participating locations.